Recently a RPM dog was part of a photo feature on a blog post by one of our volunteers. Archie, a three-month-old chihuahua, was saying a fashionable goodbye to his foster mom Kathy before he left for Colorado. Kathy’s brother is a cartoonist who was then inspired to create this sketch of Archie from one of the photos. 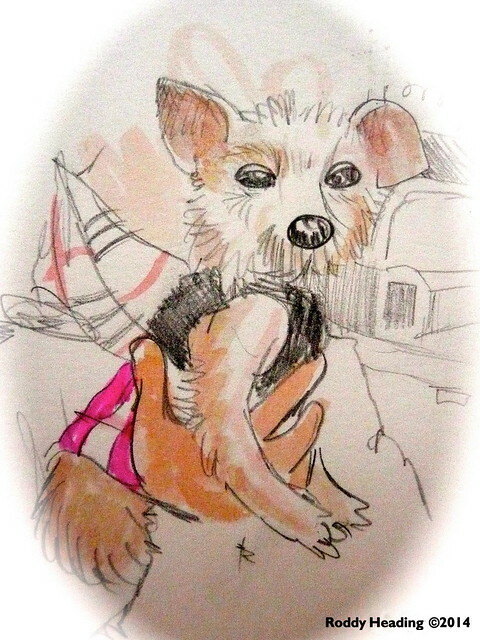 We always enjoy seeing photos and videos of our rescued pets, and now we can add artistic representations. Thanks, Kathy and Roddy, for all you do for the well-being of animals and for sharing the drawing of Archie with all of us. 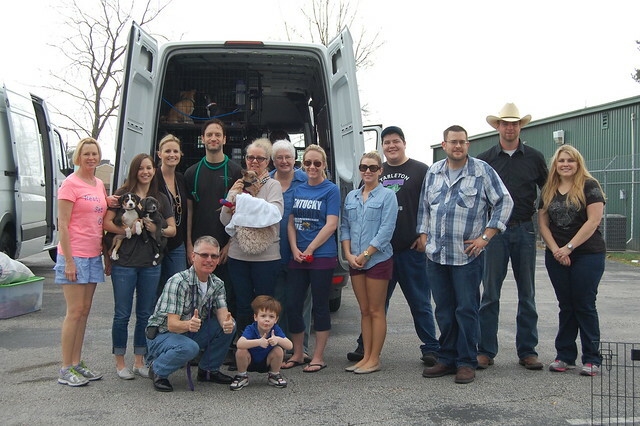 It was a big transport day–two vans with seventy-eight dogs and cats are on their way to their forever homes! A note about the cats: Though you see multiples in some crates, that’s temporary while they’re waiting to board. Each cat has an individual crate with blanket, litter box, and water. 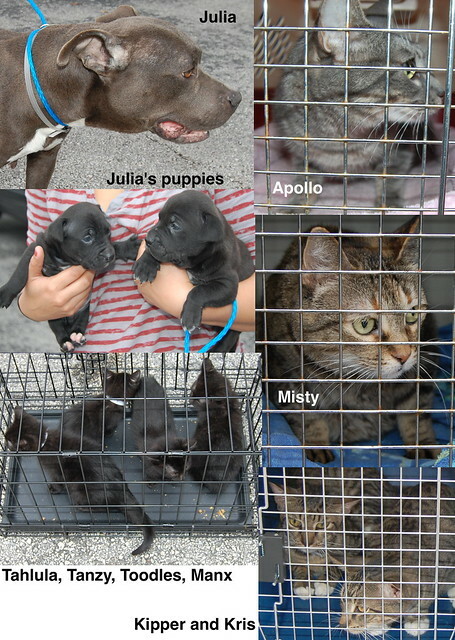 Thanks to BARC and the many, many fosters, transporters, veterinary staff, volunteers, donors, and sponsors. You’re saving lives and we couldn’t do any of this without you! A special thanks to Taylor, who manages the RPM office, and to our drivers, Mike and Joe, who take such great care of this precious cargo. We hope our supporters in Colorado will attend Puparazzi at The Watering Bowl in Denver, Colorado, on March 1st from 12 to 6 PM! PUPPY PALOOZA!!! 10 days of puppy partying. 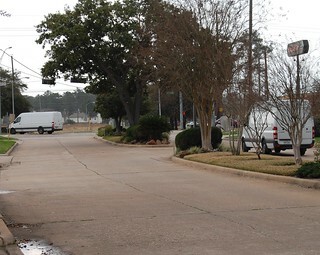 We hope your Monday has been an enjoyable one and that you are taking advantage of one of the BEST things about Houston–the winter weather! What better way to enjoy these gorgeous days than to share it with an RPM pup (or two, or three, or four). 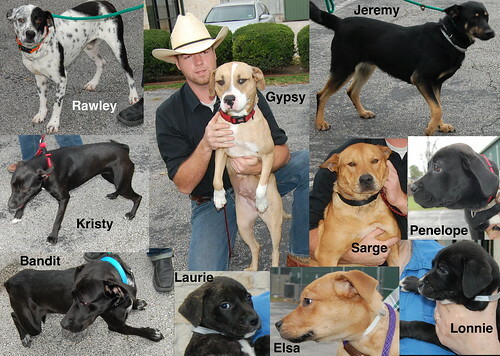 In the past few days, RPM has been able to find foster homes for several pups, but we have more waiting for you! In order to pull more BARC kiddos in need this week (which we know there are plenty of), we must get some of these little ones out of boarding and into your homes! Thank you to those of you who foster for us on a regular basis. If you are new to fostering, we love you, too. Plus, RPM provides you with a Puppy Pack full of goodies and a crate. We recommend you foster two at a time because they can comfort one another. Getting these kids into foster homes is the ticket to allowing us to save more BARC animals and ensure that NO PUPPY GETS LEFT BEHIND! 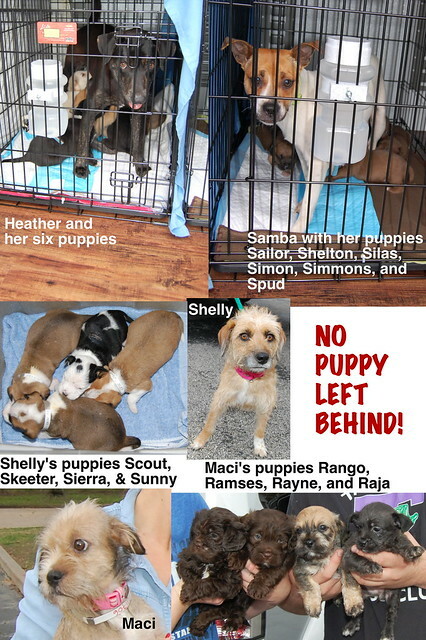 Maybe you have a friend or two who also need a little puppy loving? Email this post to them. Share it on Facebook! 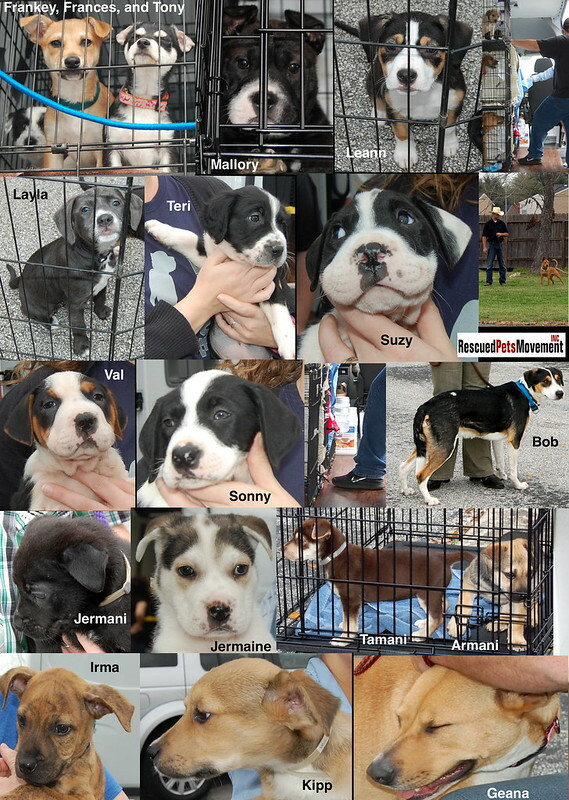 Think about the fun and joy you will bring to your friends and family by sharing this puppy palooza!!! And, as always, we are in constant need of funds to keep saving this many animals. The donate link can be found at http://live-rpm-transition.pantheonsite.io/donate/. 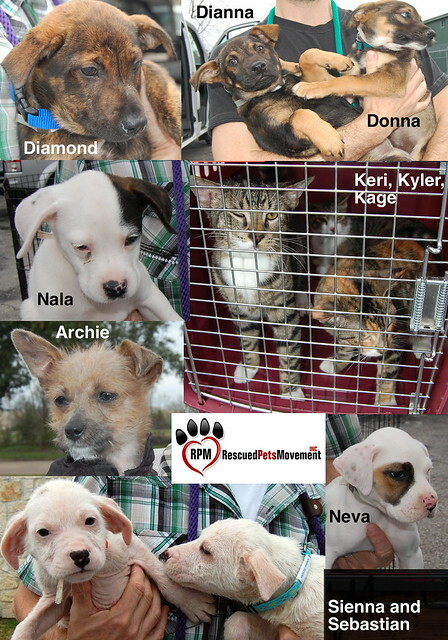 If you can foster one or more of these puppies, please contact us at foster@rescuedpetsmovement.org. You can find our foster form at http://live-rpm-transition.pantheonsite.io/foster-form/. Thank you in advance! Thank you Mike Morris and The Houston Chronicle for the article on Rescued Pets Movement in last Sunday’s paper. While we’re always happy to receive attention from the media, the headline Lack of funds could halt Houston-to-Colorado puppy pipeline: Money fades for sending pets from BARC to Colorado is pretty disheartening, don’t you think? You haven’t read the article yet? Click the link back there. I’ll wait. We’ve seen a lot of reaction to the Chronicle story on various social media sites, and it seems that many of you are quick to blame BARC for whatever reason. Please know that BARC is doing everything possible to keep us going. They’re sponsoring transports, encouraging funding from outside donors, appealing to the city on our behalf for funding, allowing RPM’s fosters access to veterinary services, promoting RPM whenever possible, and offering guidance and support whenever we need it. And we do. We’re still figuring it all out as we go along. We appreciate everything you’ve done to help us save over 1000 dogs and cats and giving them a chance at life again. We hope you’ll help us save 1000 more. Please investigate the Help Us tab on our website. The sections about fostering and volunteering are especially helpful to us. As is the section about donating. I’ll make that easy for you by putting a donate button right here.